An invisible serial killer has plagued the human population for centuries and still has not been caught. Once the killer gets ahold of its victim, it is a brutal war between the two. A person’s individual strength essentially determines his or her fate at the end of the battle, for it is not possible to get help during the fight. However, there is a method of prevention available for everyone. If treated with this method, a person’s chance of encountering the killer decreases greatly, yet some people still refuse it. The serial killer is named Influenza and the trusty method of prevention is the Influenza Vaccine. The Influenza Vaccine is offered to everyone if their initial health status accepts the help. This vaccine could potentially save lives, yet people still refuse it. Over the course of the past month, research was conducted regarding this topic. Due to the safety concerns of students and of those around them, the goal of the research project was to determine why some students in school fail to receive this vaccine and present a new idea that could potentially get more people vaccinated and lead to a healthier society as a whole. According to the CDC, 80,000 lives were taken last year in just the United States alone due to Influenza. Influenza is a contagious disease that spreads throughout the U.S. every year, typically between October and May. There are different strains of the flu, some being more severe than others, but each strain can simply be spread by coughing, sneezing, or even just close contact. Anybody is capable of getting the flu. The dreaded virus strikes a person suddenly and can last for up to two weeks. The symptoms can vary based on strain, age, and initial health status, but common symptoms include fever, chills, sore throat, muscle aches, fatigue, cough, headache, runny nose, or congestion. A severe strain of the flu could lead to pneumonia, blood infections, diarrhea, and even seizures in children. People who have a chronic illness (specifically respiratory or cardiovascular), are pregnant, are an infant, or are 65 or older are at a much higher risk of having more severe symptoms that could lead to death. The scariest part about the flu is that it is a virus – once a person gets it, it’s up to them to fight it alone. The only method of prevention is the annual vaccine. 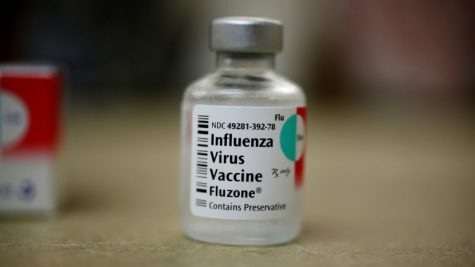 The purpose of the vaccine is to teach the body how to recognize Influenza if a person comes in contact with the virus. The two types of vaccines are the FluMist, which is a nasal spray containing the live, weakened virus and the injection, which contains killed or deactivated versions of the virus. Regardless of which vaccine a person gets, research shows that it is scientifically impossible to get Influenza from the vaccine. The flu was the leading cause of pediatric deaths last year, 80% of those children not vaccinated, yet people still refuse to consider vaccination for a number of reasons. Kaitlyn Tuttle, a senior at Pennridge High School, has never received a flu vaccine. “My family members have a history of having allergic reactions to the flu shot and my parents were concerned that I would have the same outcome”, she said. However, when asked what she will do in the future, she said “I plan on having children in the future and getting them vaccinated, as well as myself. It was a lack of full understanding and education about the influenza epidemic that caused my parents to not have us vaccinated. My parents were doing what they thought was best for me and in turn, I will take what I know now and apply it to what I think is best for my future children”. Pennridge High School Nurse, Mrs. Lynda Tennett, said that the most common excuse she hears from students that come into her office for not getting vaccinated is that their parents said no. Another common excuse she typically hears is, “I don’t need it, I never get sick”. She then went on to mention how people lack information about the dangers of the flu and that bringing that to their attention is extremely important. She also estimated that during the flu off-season, she sees about 80 students a day, but during flu season, that number increases to 120 students. She believes that there is a correlation between the amount of students and time of year. Dr. Kathleen Filograna, pediatrician at Children’s Hospital of Philadelphia Care Network Indian Valley, said that those who refuse the vaccine, “are putting themselves and others at risk”, and mentioned how a mother in their practice a few years ago was critically ill and hospitalized due to the flu. Fortunately, she survived. Dr. Filograna went through years of schooling, knows a tremendous amount of information about both the Influenza virus and vaccines, and she is in full support of the vaccine. When presented with the idea of a blood-drive-type vaccine day in school, Tuttle thought it was a great idea, claiming, “it would make it more convenient”. This may go for other students as well. Since a flu outbreak could occur in school at any given time, attempting to get as many students vaccinated as possible would lessen the risk of that happening by a great amount. However, it would be difficult to make this possible. Nurse Tennett explained that in order for this to be possible, parents would have to come in with their child in case they would have an allergic reaction. With this being said, if the parent refuses to have their child vaccinated at the doctor’s office, there is a good chance they will feel the same way about them getting vaccinated in school. Dr. Filograna said that Methacton High School, near where she resided previously, offered an in-school vaccination and is certainly in favor of it. After being educated about the unseen killer, several parents decide to get both themselves and their kids vaccinated. Though they have no clue, the killer stalks them each and every day, attempting to invade their body. The vaccine, however, enabled their white blood cells to fight it off. Others may not believe it, but thanks to the vaccine, those treated will have a happy, healthy, worry-free flu season.